Our comprehensive Jewelry Measurement Guide will assist you with many common questions regarding fitting and sizing various style bracelets including Cuff Bracelets, Link Bracelets and Beaded Gemstone Bracelets. 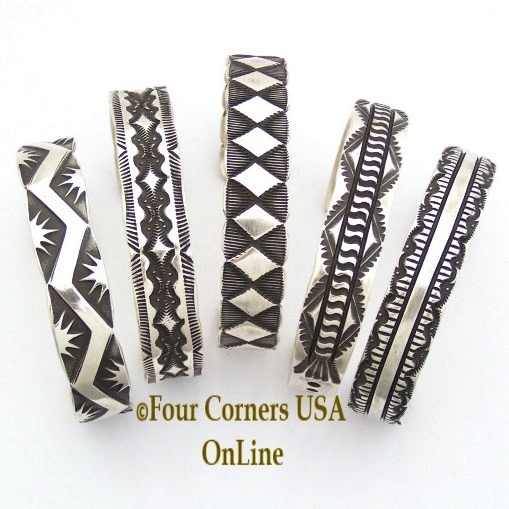 Four Corners USA OnLine Native American Bracelets Collection offers a diverse selection of metals and stones in classic Traditional and Contemporary styling including exquisite Inlay Intarsia Artistry. 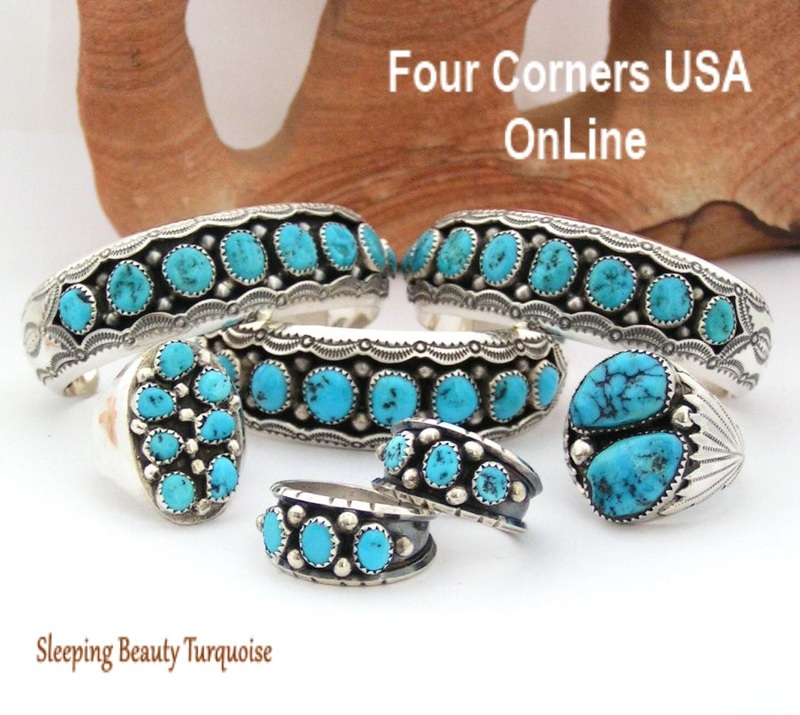 Four Corners USA Online showcases both Cuff Style Bracelets and Link Style Bracelets in an ever changing selection of popular favorites like Turquoise, Coral, all Sterling Silver, 14K Gold Sterling Mix by Bruce Morgan, Gaspeite, Spiny Oyster. We also offer Cuff and Link Bracelets with Specialty stones as in our White Buffalo Turquoise, Sleeping Beauty Turquoise and Dry Creek Turquoise Collections. Price points vary to accommodate both your personal style and budget. For the Turquoise Lover in all of us! What a fabulous adornment! Five stone adjustable Link Bracelets showcasing five different American Turquoise Mines smartly presented by one of our favorite featured Native American Silversmiths, Navajo Artisan Tony Garcia. 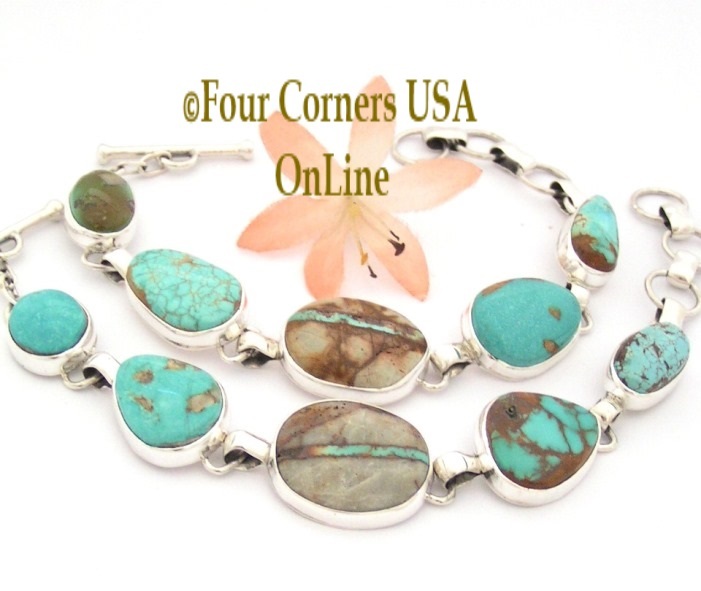 Wonderful chunky Turquoise Link Bracelets sporting awesome stone specimens from many of America's favorite mines including Royston, Number 8, Boulder, Pilot Mountain, and Crow Spring Turquoise.